Feb 28 I expected more from "Son of God"
I never blend my personal faith with my film criticism. I try to keep the two separate unless needed even with Christian reviews. In the case of this film...I can't help but speak up. After the film ended and the credits rolled, I found myself the only one getting up and walking out of the theater as the rest of the audience stayed to watch the clips playing next to the text. I was heated. “Son of God” takes the most polarizing figure in history and molds him into a beautiful, smirky/smiley, monotoned, rockstar of a man. That’s not the Jesus I follow. 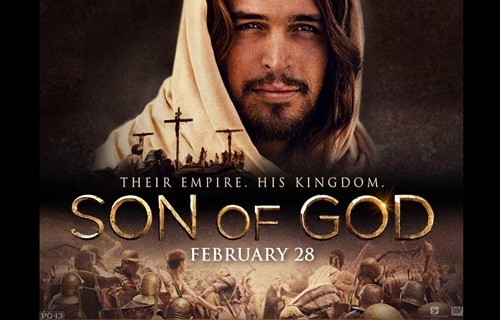 The film stars Diogo Morgado as Jesus and takes us through his life from birth to resurrection. It’s hard to compact his story into two hours and fourteen minutes. I understand that. However, the man I read about is compelling and his life story is the stuff that films are made of, but that’s not what I saw in “Son of God”. The movie plays like a Greatest Hits CD, jumping around to some of his best miracles and “verses” you’ve always heard. Jesus is the beautiful rockstar, smiling and shaking hands, while his disciples literally look like entourage following him and helping keep fans at bay. Wasn’t Jesus a carpenter? That’s a rugged job. Didn’t he have “no beauty or majesty to attract us to him”? Wasn’t he “a man of suffering, and familiar with pain”? (Isaiah 53:2-3) Why didn’t they show the complex person that Jesus was? This image of Jesus is cinematically boring and factually incorrect. Sure, Hollywood makes changes to certain biopic films to make it more interesting cinematically and to get people in seats. It’s not necessary in this case. Christians have proven that they will come out in droves for a film like this. So why is there so much out of order, or fabrication within the film? Nicodemus (Simon Kunz) visits Jesus at his camp during the day, while Judas (Joe Wredden) meets Caiaphas (Adrian Schiller) under the cloak of night multiple times. Was Mary one of the 12? I would have thought so from this movie because she’s with them in almost every scene. I’m not saying that liberties can’t be taken, but for those of us who actually read the Bible don’t insult our intelligence. While Hans Zimmer is my favorite movie composer, he did nothing to help the film. The sweeping musical numbers that occur just after a miracle, or a popular phrase Jesus said play into the caricature of Jesus that “Son of God” creates. Where his score has helped to supplement story before in films like “The Dark Knight”, “Man of Steel”, “12 Years A Slave” and more, he turns it into melodrama here. It feels like the music from a cliffhanger in a soap opera as Jesus delivers a miracle or dialogue. There are some nice touches to the film. The cool thing about putting Jesus’ life on the big screen is that you can see some of the things you’ve only imagined in your mind. Seeing Jesus feed 5,000 people was great. Seeing his hands with a hole in them after his resurrection was a touch I haven’t seen before. Watching Jesus pray in the garden at the same time as Caiaphas and Pilate (Greg Hicks) was compelling. It shines a light on how we all may think we’re doing the right thing sometimes. The film definitely touches on how interpretation of (in their case) the law can be misguided or blinds us for the sake of tradition and how things have always been done. Those are some of the complexities that I would have loved to see more of. Cinematically this film is poor, leaning heavily on believers willingness to enjoy it simply because it’s about Jesus. Biblically the film is poorly written, taking highlights and constructing them into a sizzle reel. I totally understand why non-believers would not watch this film, and why believers may love it. I heard so many people in the audience reciting Jesus’ words (I did mentally as well), and saw many people crying. To not support the film would be telling Hollywood we don’t want to see films like this. There were four time slots sold out at the theater I went to this morning. So I think this film will do well financially. I do want to see more films like this, but I think it’s time we expect more and a better depiction from a film about Jesus! Mar 30 Investigating the Interpretation of "Noah"